There is nothing better than great fish at a great restaurant. Making it at home…….I’ll be honest here, kinda intimidating. To make things even a bit trickier, I have these two pesky prerequisites that must be met before attempting to cook fish at home. It can’t taste fishy and it can’t smell fishy. Yes, very limiting but it works for me. Enter stage left…Tilapia. 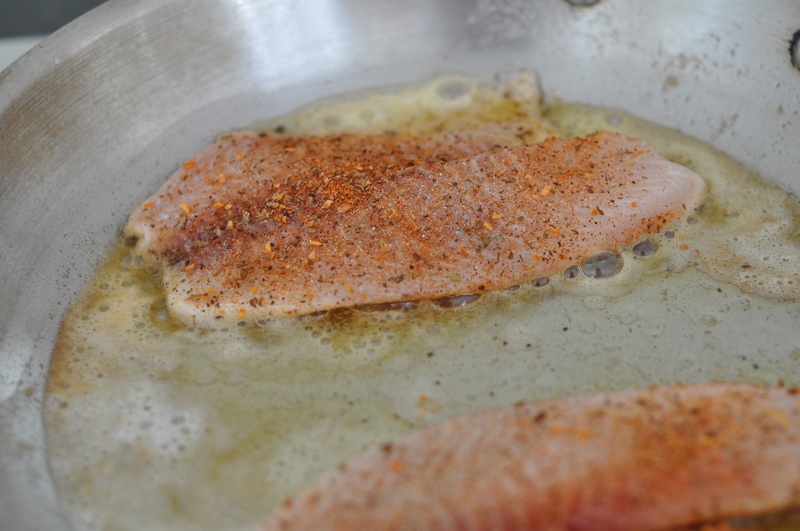 Tilapia is a buttery, flaky, firm whitefish that meets the criteria. It is very easy to find and very easy to whip up so we have it often. Although Tilapia can get a nutritionally mediocre “rap” sometimes (it is mostly farm raised on corn which lends itself to lower levels of those healthy Omega 3′s we need), it tastes really, really good so we forgive it. I buy my Tilapia at my favorite warehouse store that starts with a “C”. I need to work out a royalty deal with these guys before naming them yet again in a post. I bring home a five pound pack and open it up to make sure it smells like fresh ocean. Then we have Tilapia three nights in a row to use it all up while it is still fresh. 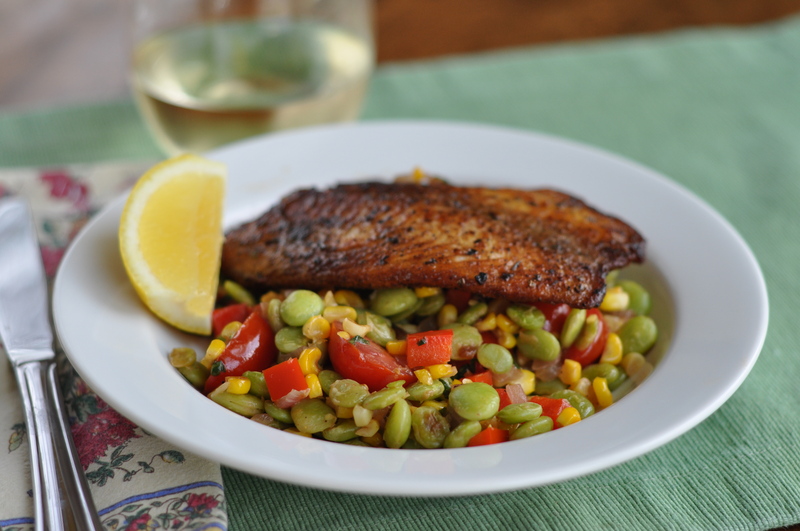 My favorite tilapia recipes are pan-seared tilapia with spring succotash (pictured above – click on link for spring succotash recipe), pan seared tilapia fish tacos with avocado salad (ditto – click on link for recipe) and another upcoming post: pan seared tilapia with asparagus, spinach and white wine butter sauce (coming soon). 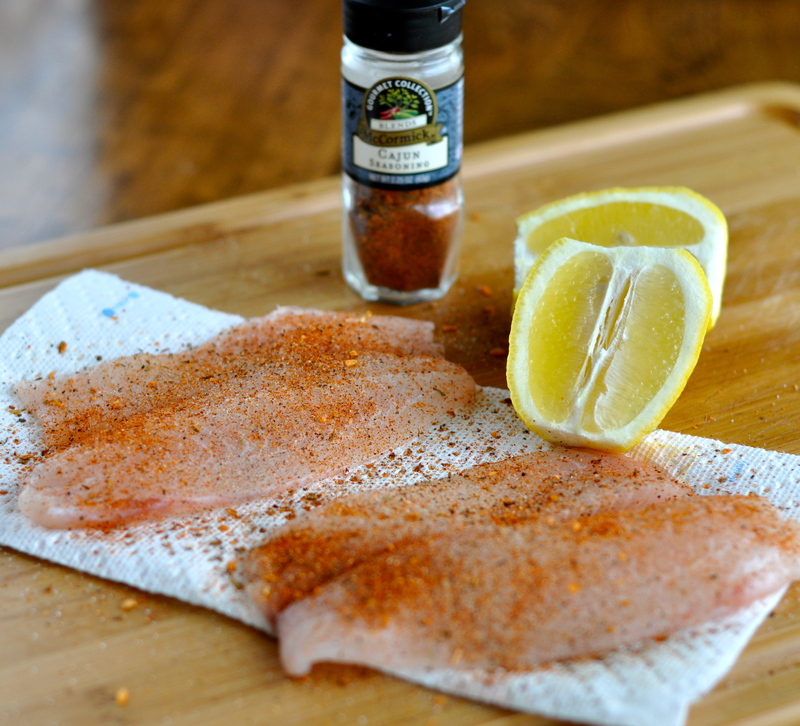 Dry the Tilapia filets off with a paper towel (necessary to get a good pan sear) and sprinkle both sides with salt, pepper and Cajun seasoning. Melt the butter and olive oil in a large saute pan over medium high heat. Add two or three filets at a time to cook. Don’t crowd the filets in the pan or you will have steamed fish instead of pan seared. 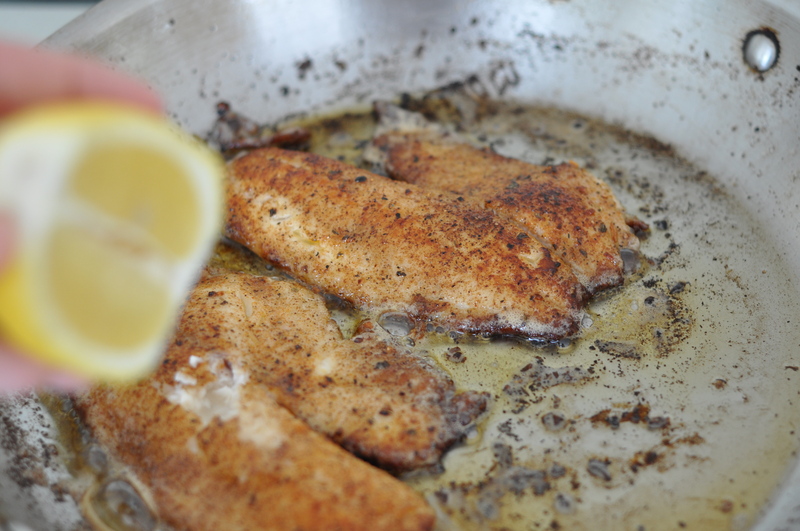 Cook the fish three minutes and then turn over with a spatula. Continue to cook three minutes on the other side. If your fish is straight from the fridge or a bit thicker it may take a little longer. I take a peak at the fish with the tongs of a fork to make sure it is done (when the flesh is no longer translucent). Finish it (off the flame) with a good squeeze of fresh lemon juice. Serve immediately and enjoy!! Gorgeous meal! This is right up my alley. And I agree with you – there’s just nothing better at a restaurant than a really great seafood meal!